John Owen was one of the Westminster Divines, Dean of Christ Church of Oxford, Vice-Chancellor of Oxford University, and chaplain to Oliver Cromwell. The treatise was written in 1656, roughly 150 years after Luther nailed his 95 theses to the door of the Wittenberg Chapel. It was 100 years after the slaughter of the Hugenots in France, and just 45 years after the King James Bible was published. Some of the animosity between the Protestants and Catholics during that period is openly expressed in this paper and should be taken in its historic context. The restatement of this important work is not intended as a renewed attack. Nonetheless, any current practice of fighting sin that substitutes something in place of God’s grace, and the power of His Spirit, may be judged by the Biblical standards John Owen outlines here. This is a restatement and simplification of Owen’s Mortification of Sin. Because the text has been modified, it should be used for teaching purposes only. If I have misrepresented the original text in any way, it is best to limit the permutation of such errors by sending readers back to that original. You may reproduce the text as long as you do not change it and you do not sell it to anyone. What has been done is this: the Old English terminology has been updated so that “thee” and “thou” are now “you” and “yours.” The difficult structure has been simplified, and the internal structure has been modified to better lead the reader through Owen’s train of thought. Sentences have been shortened and in many cases split into several sentences for clarity. Parallelism has been employed to maintain rhythm, and his unreferenced pronouns have been made explicit. The passive voice has been changed to active in most places. However, the full argument and supporting text are maintained. A few current colloquialisms have been substituted to crystallize the imagery. I apologize if they seem out of place. This is not a synopsis, but the entire treatise presented in the original work. As a result, the expository style remains. The old King James passages of Scripture, and Owen’s direct translations, have been restated in many cases for readability. Where this was done, the original Hebrew and Greek meanings were used to preserve his intent. The Scriptural references may be used to obtain a current translation in your favorite copyrighted version. For the most part, they have been moved to footnotes to aid the readability. Passages in Owen’s original work that had no citations are now marked to help the reader find them more easily. Mis-marked passages have been corrected. Where Owen cites the original Greek, a bracket containing [NT:xxxx] has been inserted with the Anglicized Greek and Strong’s numbers. Where you see “Cant.” in the footnotes, it refers to the Song of Solomon (a canticle is a song). Archaic words such as “temper” have been changed, in this instance to “state.” The word “distemper” can have several meanings. Literally it means “against temperate or moderate behavior”, but it can also mean “disease”, or “disturbance”. So it has been variously rendered “disease”, “infection”, “compulsion”, “agitation”, “disorder”, “perverted”, or “cancer of the soul” depending on the context. “Vigor” has been updated to “strength” in some instances, but left alone in others where he implies more than that, such as fullness of life, vitality, and potency. The word mortification, because it is the topic of the work, has been left alone. Owen defines it in the text of the work as he meant it to be used. It is simply the process of killing something, of putting it to death. A table of contents has been created to make it easier to locate particular passages and to serve as a general outline of the argument. The published chapter breaks and synopses have been maintained, although Owen did not use them in his original manuscript. I hope the restatement of this important work makes it more accessible to you, and helps you understand the importance of putting sin to death so that Christ might reign in your life in fullness of communion. Owen explores in great depth what it means to kill sin in our lives. Killing sin is a path that we take toward personal holiness. It is how we maintain communion with God by honoring him with our obedience, exercised in cooperation with, and under the power of, the Holy Spirit. Holiness is not a list of do’s and don’ts, like not swearing or not drinking alcohol. That would only be returning to the law that Christ freed us from. In his book Pursuit of Holiness, Jerry Bridges reminds us that holiness means “morally blameless” as God defines it in the Bible (Ps. 18:21-23). It means set apart for God’s purposes. It does not mean sinless. If we never broke a law, we would be sinless. That is an impossible goal. The Bible tells us that, “all have sinned and fallen short of the glory of God” (Rom. 3:23, Pro. 20:9, 1Jn.1:8). Bridges succinctly put it, it is not what we are against (sin), but what we are for (God) that counts. Joseph understood this idea when tempted by Potiphar’s wife (Gen. 39:9). David said, “Against you only have I sinned” (Ps. 51:4). We sin against God, not other people. Because sin separates us from God, we want to kill it to draw closer to Him. If that is our motive and our purpose, then we can succeed in killing it. Too often we attack sin because we worry about what others think of us, or how we feel about ourselves. That is not what holiness is about. That would be self-centered. Holiness comes by faith, and yet faith takes effort. It means being faithful and trustworthy in our relationship with God. Killing sin is a duty that we are committed to, rather than a hobby or a sport that we play at. All sin, no matter how little, breaks faith with God and violates his law (Mt. 5:19). That is why we need to put all sin away, the little things as well as the big things. 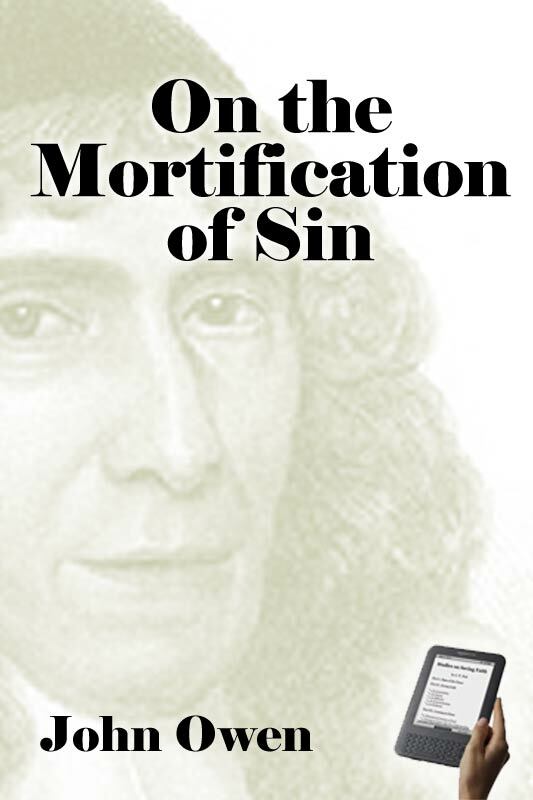 John Owen tells us sin is more a reflection of our heart than a behavior. It is the inward desire, not the outward action that embodies sin. The sins we commit are just symptoms of an underlying deadly disease. Sin kills, and so we need to kill it before it kills us. It destroys relationships; it shames us; and it ruins our full enjoyment of life. But with faith in Christ, and by the power of His Spirit, we can overcome sin so that it no longer rules us. the word “wound” refers to the effect of the deed on our conscience and on those around us. I hope you use Owen’s treatise in this updated language to benefit your personal walk with God.